Both anecdotes and data seem to suggest that Indian health insurance polices that are bought by us as individuals don’t pay up as much as they should. As we listen to the stories of our friends and family about the run around given by hospitals and medical insurance firms to pay up claims of a hospital bill, we quietly send up a prayer—please let me not be the one whose claim is rejected if I ever need to use my policy. There is increasing distrust in the medical insurance market for privately bought covers. Covers bought by corporations, called group covers, seem to have less problems of claims getting rejected. The anecdotes are supported by data. A May 2018 working paper, titled Fair Play in Indian Health Insurance has done a deep dive into the sector. The big findings are two. One, claims are not paid as much as they should be. Two, India has the highest complaints rate when compared with other countries. The claims ratio is a key number to judge if the insurance industry, in general and a firm, in particular, is being fair to its customers. A claims ratio shows how much of the premium collected is paid out. A claims ratio of 100% means that the company is efficient. A claims ratio of over 100 means that the firms are unviable—they are paying out more than they are getting. 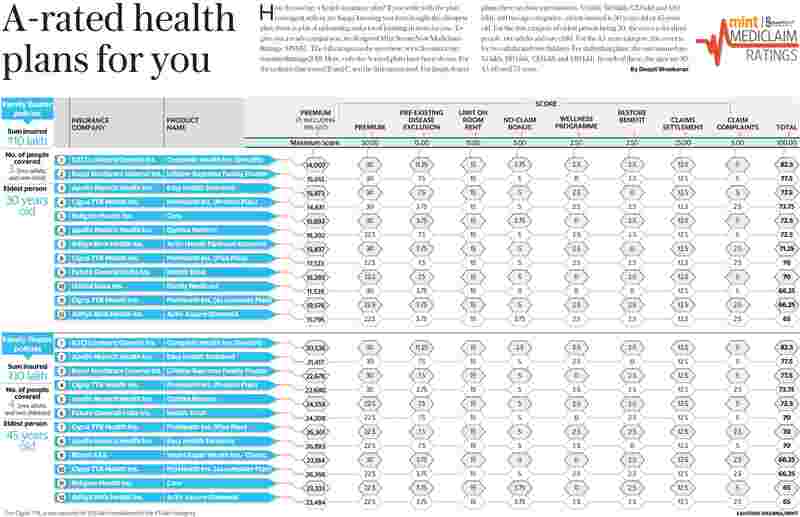 Most of the Indian public sector health firms have a ratio of over 100%. 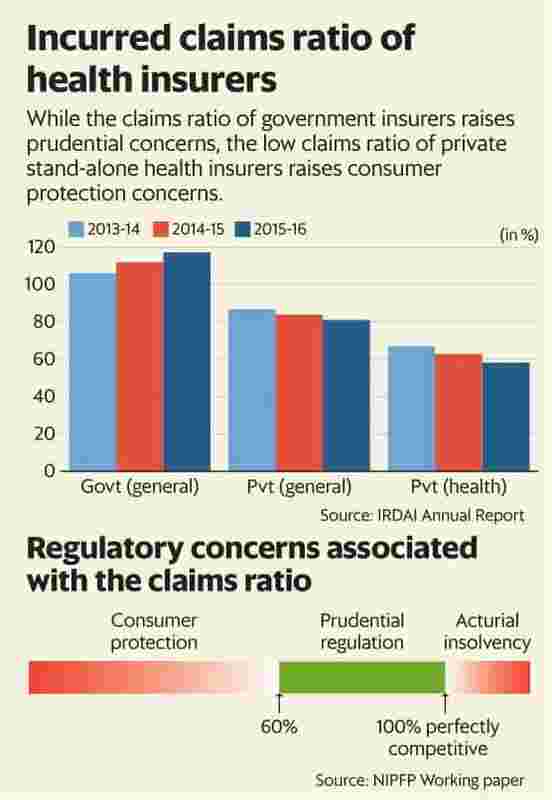 The problem sits in the data for private health insurance claims ratios: these are at 58% in 2015-16, down from 67% in 2013-14. The paper says that such low claims ratios raise the issue of consumer protection. “The observed claims ratio in India would have triggered mandatory refunds if they were operating in the US," says the paper. Some countries make refunds to consumers mandatory if the claims ratio is below a certain threshold. For example, a claims ratio of below 80% in New York will trigger a refund. A poor, and declining, claims ratio in India points to high costs and an unwillingness to pay privately bought health covers. The paper also finds that India has the highest complaints rate when compared to other countries. The paper also uses case studies to show the unwillingness of insurance firms to even abide by the contracts they have written themselves, their arrogance in not even appearing for hearings when the customer goes to court and the irrelevance of the paltry fines imposed by the regulator when firms are found guilty. The paper documents the failure of the ombudsman system in insurance. Of the 17 ombudsmen in India, in March 2018, “all offices of the insurance ombudsman were vacant. Some of these offices were vacant for 2-3 years in 2017 resulting in a large backlog of cases". The dice is clearly loaded against an individual buying health insurance in India. When a market gets privatised, as insurance did in 2001, the government appoints a regulator to make sure that the rules of the game are put in place and there is no market failure. Unfortunately, for the Indian consumer of insurance products, while a regulator was put in place, it took forward the basic mindset of a monopoly market in which consumers did not matter. We need an urgent change in regulatory thought in medical insurance. The regulator needs to shed its capture by the industry and work in consumer interest. We have no option but to buy medical cover given the high and extractive costs of Indian hospitals. Today we are at risk of paying a hefty health insurance premium for years and then also facing the risk of the insurance firm refusing to pay for an imagined or convoluted reason. For example, this paper documents the case where an insurer refused to pay for an organ donation surgery despite the policy explicitly having a clause that covered the costs of this organ transplant. In another case, the insurer did not even bother to appear in court when taken to court for non- payment of a claim. What can we do? First, be very sure of what policy you are buying. There is fine print and exclusions that will hurt you when you go for a claim. Use the Mint SecureNow Mediclam Ratings to choose a policy—we’ve done a deep dive to figure out which are the policies with good features and reasonable costs. You can see the ratings here. Second, go through an agent or broker who you know and can lean on to push the insurance company to pay up. Third, if the company refuses to pay up, make a big noise about it. The unwritten rule in some firms is to pay the claim if the customer makes a lot of noise. Even as the government is rolling out a medical cover for the poor, it also needs to push the insurance regulator and the medical system to treat the patient fairly. Monika Halan is consulting editor at Mint and writes on household finance, policy and regulation.